I have been MIA from this blog for a little over 2 months..oops! :)I'm about 18.5 weeks now. 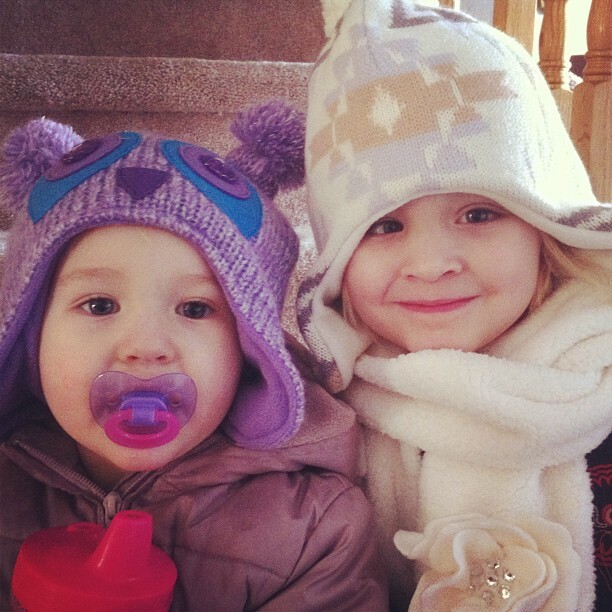 Our two girls Emma & Audrey couldn`t be happier to have another sibling entering our family!! her "mama is having another baby"
Now for a fun pregnancy survey that I will try to do every week on here. Best Moment of the WeekHearing the baby`s heartbeat at my Dr`s appointment Thursday! MovementFinally started feeling movement this week! This baby is giving me grey hairs already. I had already felt both girls long before 18 weeks. Food CravingsPopsicles! Avocado! Felafel's wraps with Hot Sauce! Poutine from Harvey's! Food AversionsSuch an odd aversion but Italian food. I usually love home cooked Italian meals from hubby's mama but this pregnancy I don't even want to look at it! Labor SignsNo! And hopefully not for another 20 weeks at least! What I missBeing able to do winter type activities like tobogganing...especially on a snowy day like today! Going to find out the gender!! hey lady! !How awesome that you are having a boy too!! I am over the moon that Im having a boy and I can not thank God enough! I lost you on my dashboard some how... for some reason my blog reader doesnt pull you up, but hopefully i'll make it work and start over by following again.